“Our music is focused on simplicity and nakedness, largely stemming from the stripped down set-up,” The Clearwings’ Mark Phillips explained to AXS. “At the same time, we strive to create something full and rich and surprising from a duo. We enjoy exploring the simplicity—can we make it rock, or have some soul, or some swing?” Though Phillips is currently in recovery from hip replacement surgery, he and bandmate Raven Adams are hard at work finalizing their new EP, Rocks in My Shoes. Recorded at the end of 2015, this alt-folk duo (along with Mark’s new hips) hope to hit the road later this year. 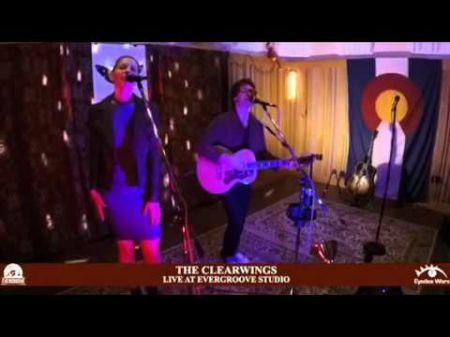 Both musicians shared their exploits as The Clearwings in this exclusive Q&A. AXS: Are you Denver natives? If not, where is everyone originally from? Mark Phillips (guitar, vocals): I grew up in the foothills near Golden, actually right by the buffalo herd on I-70. Raven Adams (vocals, percussion): I am originally from Santa Cruz, California, right by the beach boardwalk. AXS: What brought the band together? Raven: We met at college in Maine and started playing music together casually, but things picked up after we moved to Denver in 2009. We finally decided to start working on music in earnest in 2013 and formed The Clearwings soon afterwards. AXS: How long have you guys been together? What have you learned during that time? Mark: Well, as Raven said, we played together casually for years. In December 2013 we started performing beyond the campfire, and that transitioned pretty quickly to playing shows and regular gigs. We started with folk tunes and unusual covers and began incorporating original material as soon as songs were ready. I think the biggest thing we’ve learned is how much more there is to making a song work on stage than just getting the notes right. We’re learning how to put on a show, keep the energy up for every song, and give the audience something to care about. AXS: Where was your first show in Denver, and what was the experience like? Who else did you play with at the show? Mark: Our first Denver show was at Paris on the Platte. I used to skulk around there in high school, so it was fun to come back years later and see it mostly unchanged—a lot less smoky, I guess. We played with Perry West, a singer/songwriter. Paris did shows on the weekends, and there was always a nice crowd on Friday and Saturday. Rob, the guy who ran it, made sure it was a welcoming, friendly place and was important in encouraging a lot of acts that were just getting started. It was a great place to have a first show—Denver lost a great spot when Paris closed. AXS: Have any Denver musicians inspired your group? Mark: Absolutely – one aspect of the Denver sound we really like is the rollicking, rocking Americana. I would point to bands like Tomahawk Fox for that. And I would definitely say watching Nathaniel Rateliff skyrocket over the past year or so has been pretty exciting. Strawberry Runners is another band that we love – such a unique, fresh sound. We actually got the chance to do some backing vocals on their new album a few months ago, and getting a peek at the process of putting together a project like that was very inspiring. AXS: What projects are you currently working on? Raven: We always have a few projects going on at any given time. We made it into the studio again before the end of last year, and just gave the green light to master those recordings. Our new EP, Rocks in My Shoes, will be coming out this spring, so we are working on album art and press materials. Mark: The new release also means that we are planning a tour to promote it, which means booking shows and figuring out logistics for travel. AXS: What other stuff are the band members involved in locally, either as individuals or as a group? Raven: This past year I started working with organizations devoted to equal access to the arts in the disabled community. In particular, I volunteer with BrainSong to help organize sensory-friendly concerts for children with autism. I have been really inspired to see how music affects children and their families, and I want to continue this work. The Clearwings will also be performing at the BrainSong annual “no-shushing” concert in Boulder in June 2016. Mark: Raven has actually started developing a new nonprofit organization to support equal access to the arts and scientific research on the connections between music and the treatment of brain disorders, and I’ve been able to help with that project. AXS: Do you have a goal in mind for the sound the band produces? Are there certain influences or themes the band tries to inject into its own music? Mark: Our music is focused on simplicity and nakedness, largely stemming from the stripped down set-up. At the same time, we strive to create something full and rich and surprising from a duo. We enjoy exploring the simplicity—can we make it rock, or have some soul, or some swing? AXS: For someone who has never seen or heard you play, what would you tell them to entice them to watch your set? Mark: Come to a concert so we can show you that you don’t need any amps, drums, or electric guitars to rock. We will folk you up! AXS: What would your ideal live show look like? Where would it take place? Any particular time of year? Would a specific band/musician share the bill with or open for you? Raven: My ideal show would be at Red Rocks in the early summer, because it is such a beautiful place to share music with a live audience. I fell in love with that venue when Mark took me to see Jack White for my birthday in 2014 and he played through thunder and lightning – hopefully the weather would be better than that! I think we’d open for Strawberry Runners, especially because (as Mark mentioned earlier) we teamed up with them to do backing vocals on their album, so I imagine coming on stage to do those songs live. Nathaniel Rateliff & The Night Sweats would headline because I can’t stop rocking out to their songs and I want to sing along from backstage. AXS: What do you enjoy most about Denver’s music scene, and why? Raven: I think one of the things that makes the music scene in Denver appealing is that it has enough going on for a variety of audiences and musicians. The open mic scene is rich and well attended, and I think it provides a great community for artists at a lot of different levels. New bands can find stage time, but there are also big venues to attract national acts and everything in-between. It creates a strong local scene and means you can find good live music any night in this town.